The differences between the oscillation frequencies and uncertainty estimates of a star derived by different fitters can be large, sufficiently large so that, were one to find a stellar model that fitted one frequency set ($\chi^2\sim 1$), it does not fit an alternative set. 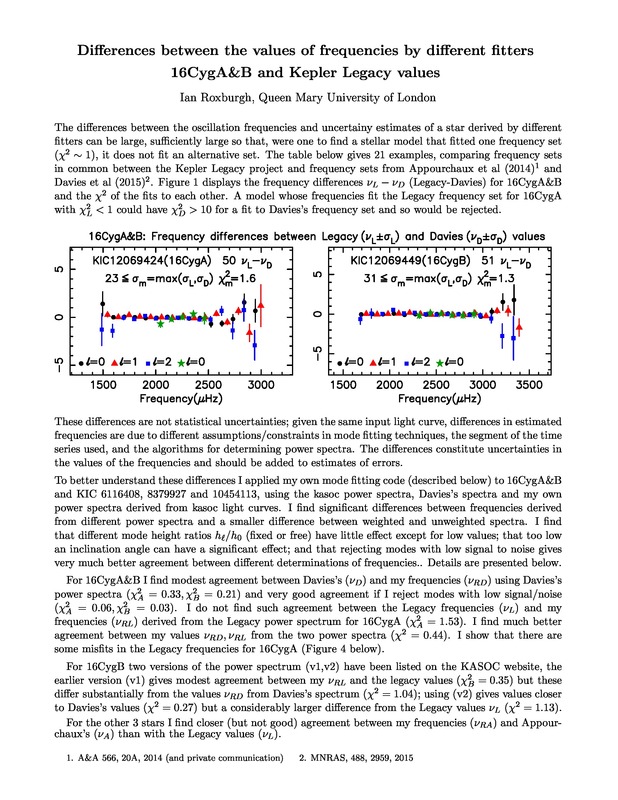 I give 21 examples, comparing frequency sets in common between the Kepler Legacy project and frequency sets from Appourchaux et al (2014) and Davies et al (2015). For 16CygA\&B the differences are large; the $\chi^2$ of the fit of Legacy to Davies's values ranging from 1.64 to 11.47 for 16CygA and 1.62 to 1.79 for 16CygB, depending on which error estimates are used. I analyse both stars in some detail applying my own mode fitting code to both the Legacy and Davies's power spectra and find reasonable agreement with Davies's full frequency sets and very good agreement between values for modes with signal/noise > 1 ($\chi^2 = 0.06, \chi^2_B=0.03$). But the difference with the Legacy values remains large even for modes with S/N>1. I also examine the effects of different power spectra (weighted and unweighted) using the kasoc light curves for Q6-17.2 and Q7-Q16, the effect of different mode height ratios and different rotational splitting and inclination.